Quitman UMC members are still celebrating the joy of inviting people to church – some that visited for the first time and others that returned after long absences. Prayer cards were passed out and members were encouraged to prayerfully consider whom they should invite. Each of the 3 Sundays prior to the event, funny announcements were made, including a prompt for people to raise their hand if they had invited a guest. 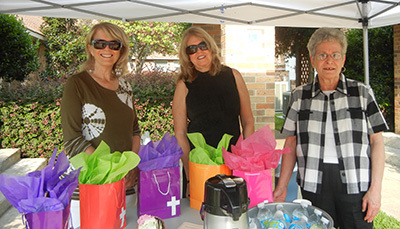 A tent was set up near the entrance to the church where visitors were greeted and provided with coffee, donuts, and a gift bag that included: a handwritten thank you note from the pastor, flyer announcing our mid-week Wednesday Night Live (WNL) program for fall and a coupon for a free WNL dinner, business card showing church Mission and Vision statements, brochure showing map of the facility and listing of regularly scheduled activities, a notepad and church pencil and candy.